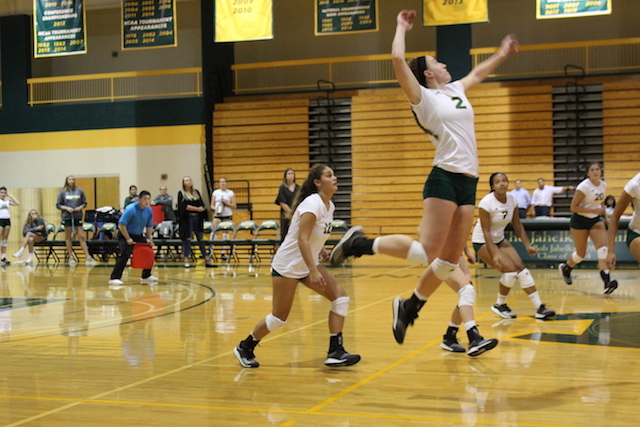 The LIU Post volleyball team played with a new purpose during their match against the Queens College Knights on Friday, Oct. 6, their first since LIU’s announcement of the upcoming “One LIU” athletic department merger. The Pioneers beat the Knights with a 3-0 (25-16, 25-8, 25-18) win that placed them 12-8 for the season and 4-2 for the East Coast Conference. This game set a season high 13 services aces, the most in a three-set match since scoring 15 on Sept. 16, 2017 against Wilmington University. 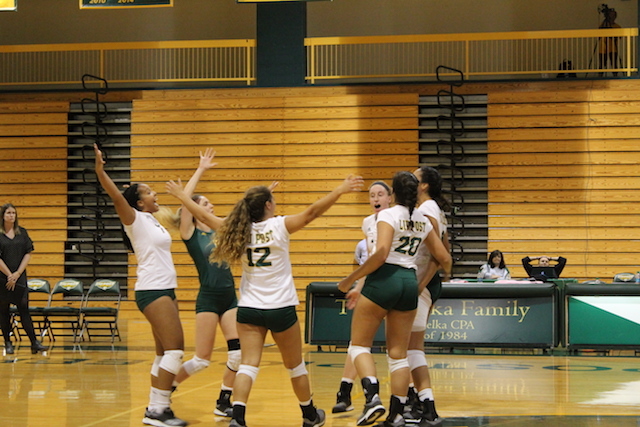 The Pioneers used long runs in the second (25-8) and third (25-18) sets to secure their win. Senior outside hitter Rachel Londot, who was ECC women’s volleyball player of the week on Sept. 24, led the match with four service aces, six kills and 12 digs. Seven Post teams, including volleyball, will elevate from Division II to Division I in the 2019-20 season, and all Post indoor sports will move to the Brooklyn campus. “We were fired [up]; we wanted to prove something — we still want to prove something. This is our last season as LIU Post, so let’s make it the best,” said senior setter, Giulia Genna, explaining the mindset of the members of the team that night. The members of the volleyball team, along with student-athletes on other LIU Post sports teams, oppose the merger. 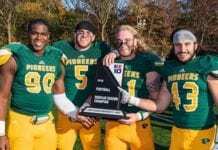 The Pioneers made a stand during their warm-up before the game by wearing their LIU Post t-shirts inside out, and taping over “LIU” on their jerseys during the national anthem. They did not cover the name during the game. 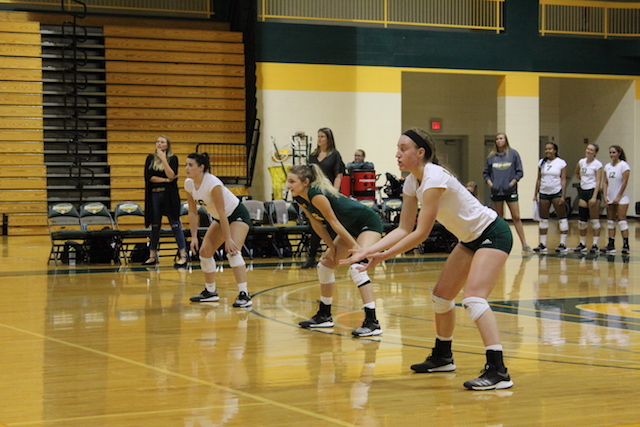 “We intended on taping the LIU on our jerseys, but we were told we could not do that by the refs,” said senior middle hitter, Elise Strange, later adding that the administration also told players they could not cover their jerseys. The team dominated in the first set, and continued to accumulate points throughout the next two sets. They were not holding back. “[The announcement] puts a different kind of spirit in you, and a different reason to play. We’re really playing for the school (Post) now, in addition to recognizing this is the last time we’ll play together,” Strange said. In their season opener, the Pioneers defeated both the Franklin Pierce University Ravens and the Texas A&M International University Dust Devils at the Raven First Serve Invitational on Aug. 24. The Pioneers ran the Ravens through three sets to victory, and the beat the Dust Devils 3-1. Friday’s win for the Pioneers follows after a narrow loss prior in the week against the University of New Haven Chargers on Tuesday, Oct. 2. The Pioneers pushed the Chargers to five sets, recording more kills, assists and digs, but ultimately came up short on a 15-8 loss in the fifth. On Saturday, Oct. 6, the Pioneers faced Molloy College in a tight match, ultimately losing 3-0 (25-20, 25-22, 25-22) to Molloy. But the Pioneers aren’t giving up yet. The Pioneers’ next match is Wednesday, Oct. 10 at 7:30 p.m., against New York Institute of Technology in Old Westbury.